Meter readings and energy-saving notes for dual fuel use at home in 2009. Just by itself, me stopping having a hot bath every single day saved 2 units of gas and therefore about 400g of CO2 emissions per day from 2009! 2009 data (kWh: e used 1942, e gen -2958, g 6201). 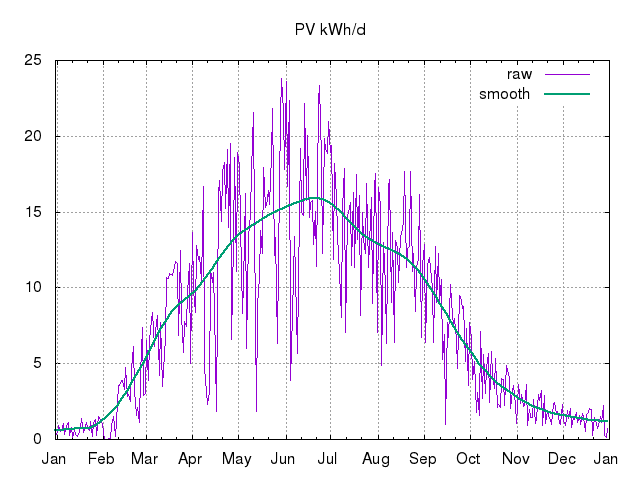 See the daily PV generation logs for 2009 as .csv and .png chart. Analysis of 2009 figures shows ~1MWh electricity net export (~0.44tCO2 displaced elsewhere on the grid), and ~6MWh gas consumption (~1.2tCO2 direct emissions). That results in a net primary-energy CO2 footprint for the house of ~0.74tCO2. Down from 2.2tCO2 in 2008 and 6tCO2 in preceding years. There were two of us here initially; now there are four. Note that we start/run about 25% of our gross electrical consumption/loads (dishwasher and non-cold washing-machine cycles) during the night ~1am to ~6am when grid carbon intensity is lowest. Our solar PV in contrast is generating and exporting mainly when grid carbon intensity is highest. So chosing a flat intensity figure should be reasonable and conservative. In 2008 I estimated our daily cooking and hot-water gas consumption at 8kWh/day. In 2009 I believe that we've reduced that to ~6kWh/day ie ~2MWh/y (partly due to me taking fewer, shallower, cooler baths). This has the side-effect of reducing our apparent heating-efficiency gains! Given the 2009 HDD12 of 1068 this indicates ~3.8kWh/HDD12 heating efficiency for 2009. This is roughly in agreement with the estimate for the start of 2009, once the reduced daily cooking/DHW 'baseline' consumption is allowed for. My aim for 2010 is to increase solar PV generation to export ~2MWh/year net (thus deferring an extra ~430kgCO2/year on the grid), and improve insulation and reduce DHW use to save ~1.5MWh/year gas (~290kgCO2), to get us approximately carbon-neutral for primary energy, ie achieve a "zero-carbon home". A somewhat longer-term goal is to replace the gas combi with a heat-pump once the year-round CoP, and the grid's carbon intensity, will result in less CO2 emitted, which implies a CoP > 2.5 at 0A/55W (0°C ambient, 55°C DHW/rads). iMeasure used the 2007 emission factor guidance from DEFRA: gas is 0.206kgCO2/kWh and electricity is 0.523kgCO2/kWh (5-year rolling average). 2009/01 214 (6.9/d) -23 (-0.75/d) 1285 (41/d) 20081231-18:09-GMT to 20090131-18:05-GMT (31d) Import meter unratcheted, so reading of ~191kWh shown with ~23kWh of the PV generation added back on. HDD12=266 vs 140 last January (temperatures ~1.5°C lower) but ~10% less heating/gas demand, so roughly doubled heating efficiency. Heating is now set to come on for about two 15-minute slots during the night if the house temperature drops below ~15°C since our little one's thermoregulation still needs some help: this keeps the night-time temperature more stable than it might otherwise be on very cold nights. That's somewhat less than we have had in the previous couple of months, and it doesn't seem to increase gas consumption enormously. This is a frugal form of 'setback' temperature. I note that we used exactly the same amount of electricity as last January, so an efficient fridge seems to have exactly compensated for a newborn! 2009/02 178 (6.3/d) -73 (-2.6/d) 1046 (37/d) 20090131-18:05-GMT to 20090228-18:03-GMT (28d) Import meter unratcheted, so reading of ~105kWh shown with ~73kWh of the PV generation added back on. PV system expanded (tripled in size) early this month, nominally making us net exporters/generators over the course of a year. HDD12=203 vs 172 last February, but much less gas used. 2009/03 177 (5.7/d) -254.5 (-8.2/d) 778 (25/d) 20090228-18:03-GMT to 20090331-16:40-GMT (31d) Import meter unratcheted, so reading of -77kWh shown with ~255kWh of the PV generation added back on. Upgraded to more efficient washer/dryer that can wash in cold/unheated water which may thus save us ~0.5kWh/day depending on laundry soiling/mix. HDD12=140 vs 157 last March, but disproportionately less gas used. 2009/04 149 (5.0/d) -356 (-11.9/d) 265 (8.8/d) 20090331-16:40-GMT to 20090430-20:23-GMT (30d) Import meter unratcheted, so reading of -207kWh shown with 356kWh of the PV generation added back on. Central heating has been off for most of this (unusually warm) month. HDD12=57 vs 105 last April. 2009/05 147 (4.7/d) -458 (-14.8/d) 226 (7.3/d) 20090430-20:23-GMT to 20090531-17:33-GMT (31d) Import meter unratcheted, so reading of -311kWh shown with 458kWh of the PV generation added back on. HDD12=25 vs 22 last May. 2009/06 130 (4.3/d) -485 (-16.2/d) 144 (4.8/d) 20090531-17:33-GMT 20090630-18:06-GMT (30d) Import meter unratcheted, so reading of ~-356kWh shown with 485kWh of the PV generation added back on. HDD12=8 vs 6 last June. 2009/07 163 (5.1/d) -447 (-14.0/d) 203 (6.3/d) 20090630-18:06-GMT to 20090801-13:26-GMT (32d) Import meter unratcheted, so reading of -284kWh shown with 447kWh of the PV generation added back on. HDD12=1 vs 3 last July. Single-glazed front door replaced with double-glazed unit, and internal door fitted between living-room and corridor. I'm not sure why our electricity consumption is apparently up a little, though July was fairly damp and dull. 2009/08 143 (4.8/d) -374 (-12.5/d) 166 (5.5/d) 20090801-13:26-GMT to 20090831-18:00-GMT (30d) Import meter unratcheted, so reading of -231kWh shown with 375kWh of the PV generation added back on. HDD12=2 vs 1 last August. 2009/09 154 (5.1/d) -256 (-8.5/d) 189 (6.5/d) 20090831-18:00-GMT to 20090930-17:03-GMT (30d) Unratcheted import meter replaced during the month with an import/export meter pair (both initially reading 1.6kWh). We lost about 1kWh of generation while our mains was disconnected, and thus our grid-tie was off-line, while the replacement took place. Up until the meter replacement the old meter reading was -84kWh, and generation was 182kWh, thus making for a net consumption of 99kWh for the month until then. Since the replacement we exported 51.5kWh of the generated 73.3kWh, and imported 33.3kWh, making net consumption 55.1kWh. (That is, net consumption = generation - export + import.) We directly consumed in the house 30% ((gen-exp)/gen) of our PV generation. Or, another way, we avoided importing 40% ((con-imp)/con) of our consumption. Total consumption for the month was 154kWh. HDD12=7 vs 11 last September. 2009/10 155 (5.0/d) -126 (-4.1/d) 300 (9.7/d) 20090930-17:03-GMT to 20091031-17:20-GMT (31d) Meter readings: electricity generation 125.9kWh, export 91.4kWh, import 120.2kWh (thus net consumption (I+G-E) 154.7kWh); gas 27.071m^3 (so 300kWh @ 11.1kWh/m^3). Replaced 24x7 Internet laptop/server with entirely off-grid-solar-powered SheevaPlug (@~4W) which I believe has caused mains electricity consumption to drop. 2009/11 161 (5.4/d) -61.5 (-2.1/d) 558 (19/d) 20091031-17:20-GMT to 20091130-17:26-GMT (30d) Meter readings: electricity generation 61.5kWh, export 36.1kWh, import 135.7kWh (thus net consumption (I+G-E) 161.1kWh); gas 50.245m^3 (so 558kWh @ 11.1kWh/m^3). Battery got very low so SheevaPlug back on mains for some of this wet and windy month. HDD12=78 vs 128 last November (cumulative HDD=812, gas 5160kWh this year; HDD12=828, gas 7689kWh last year). 2009/12 169 (5.5/d) -42.7 (-1.4/d) 1043 (34/d) 20091130-17:26-GMT to 20091231-18:07-GMT (31d) Meter readings: electricity generation 42.7kWh, export 21.0kWh, import 147.4kWh (thus net consumption (I+G-E) 169.1kWh); gas 93.919m^3 (so 1043kWh @ 11.1kWh/m^3). SheevaPlug back on mains for getting on for half of this month. HDD12=250 vs 233 last December. 1942 (5.3/d) -2958 (-8.1/d) 6201 (17/d) 20081231-18:09-GMT to 20091231-18:07-GMT (365d) Electricity consumption down ~5% on last year, generation up ~3x; now ~50%/1MWh net exporters. Gas consumption down ~30% on last year. HDD12 for the year 1068 (vs 1061 for 2008). 835kg (2.3/d) -1272kg (-3.5/d) 1178kg (3.2/d) ~0.74tCO2 (~2.0kgCO2/d) gas/electricity emissions total for 4 people, based on 0.43kgCO2/kWh for electricity (netted) and 0.19kgCO2/kWh for gas. Note that we haven't flown this year again, we still don't own a car and travel almost entirely by (usually-electrified) public transport (we drove ~80 miles in a hire/rental car in 2009). First published 2009-01-01 , updated 2019-04-22 . Site copyright © 2007-2019 Damon Hart-Davis. Hosted by ExNet.